Lake Island on Top Lake, a short walk from Coffin Pond and Quarry Gill in the Parkland, is a private retreat. Here you can hold an exclusive celebration or private event. Take a hand-drawn cable ferry across to your own private kingdom, complete with a miniature Georgian-style summerhouse. The House can be transformed into a romantic setting with flowers, candles and twinkling fairy lights, creating the perfect venue for a proposal, winter picnic or anniversary celebration. Alternatively, the peaceful and serene setting of the Lake House lends itself really well to solitude and quiet mindfulness. The island also has a stone table and fire pit for outdoor picnics in warmer months. Come and spa together with a wonderfully relaxing De-Stress Massage in our cosy couples suite. Once you have indulged in full relaxation and enjoyed the stunning facilities with two-hours use of the thermal retreat and pool areas, further indulge with Terrace Teatime and make a toast with a glass of fizz each. The Terrace Restaurant is just the setting for a romantic evening with Head Chef Sam's delectable sharing menu for two. Enjoy a glass of the finest Veuve Clicquot Champagne on arrival before taking your seat to embark on a journey of tantalising tastes. 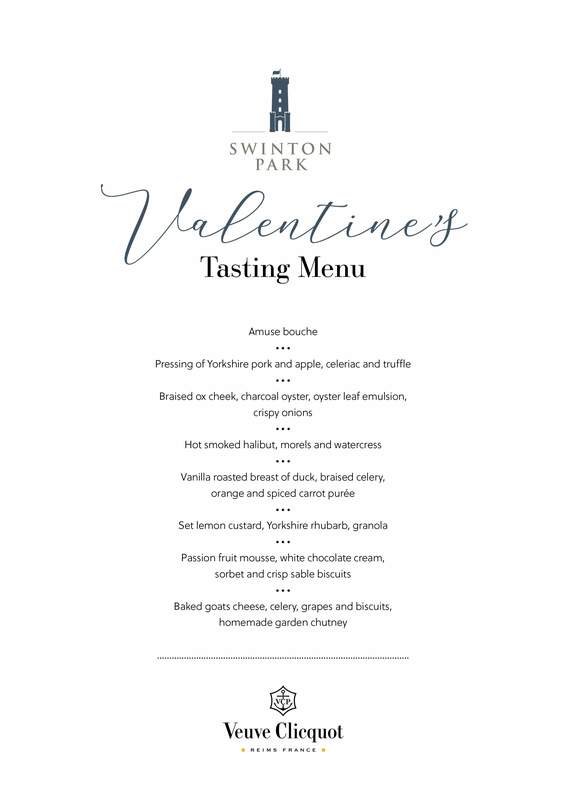 On Valentines Day, 14th February, join us in the romantic setting of Swinton Park where a table for two is waiting for you and your loved one in the ornate Samuel's Restaurant. Head Chef James and his talented team will treat your taste buds to a senses spectacular of an 8-course tasting menu. Indulge in a quintessential British ritual at Swinton Park. Traditional Afternoon Tea is served by the fire in one of the grand stately rooms, including the Georgian Drawing Room. Served daily from 12noon until 5pm and on Sundays from 3pm until 5pm. Treat a loved one to a castle stay in the luxury Swinton Park with stunning views overlooking the rolling Yorkshire hills. Indulge with dinner in an award winning restaurant, followed by an overnight stay in a beautifully appointed bedroom and breakfast. Relax with use of Swinton Country Club & Spa throughout your stay. Why not order a bottle of the finest Champagne, the biggest, brightest bunch of flowers and a plate of delicate chocolates to be waiting in your room? Relax in the tranquility of the spa as it becomes exclusively yours for two hours after closing, with use of the thermal retreat and pool areas all for yourselves, lounge poolside with your loved one or a group of friends with a personal butler at your call, serving poolside Champagne and Canapes. Personalise your evening with spa treatments to suit your wellbeing needs and choose when you dine. From a Cookery Course in the stylish Cookery School, to being cooked the finest meal in a grand dining room. From living like Lord and Lady for the night, to re-discovering your wellness together. There are gift vouchers available for Him and Her. The private, luxury hotel and parkland grounds of Swinton Park are lovingly curated in the beautiful Yorkshire Dales, creating a stunning backdrop for a wedding which is unique and truly incredible. If you have ever dreamt of having your special day in the beauty of the great outdoors, and want something that is magical, memorable and creative, a woodland DIY wedding at Bivouac is for you. There are limited dates remaining for 2019. Contact our friendly and professional Wedding Coordinators for more information.